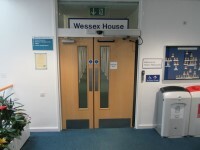 Services / facilities within the building include the School of Management, marketing offices, council chambers, seminar rooms, faculty of science, student finance and Wessex Restaurant. 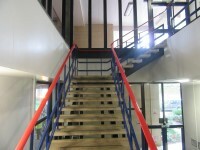 There is an East and a West car park for visitors and staff on the campus. Because of limited parking space, there are restrictions on students bringing cars onto campus. 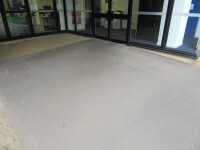 Accessible parking is, however, available for visitors, staff and students as marked. Students needing to park on site because of a disability are provided with permits. Please see the separate guides for each car park for details. 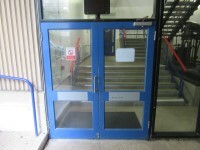 You are on Outside Access (South). Skip to the next section. 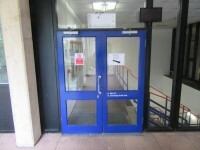 This information is for the entrance located next to the Access and Control Centre. 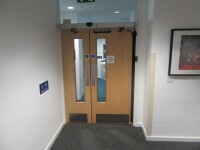 The width of the door opening is 156cm (5ft 1in). 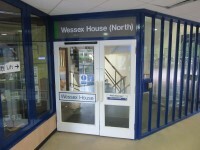 This entrance gives access to the South Side of the building. 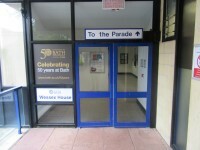 There is an entrance with no doors on the opposite side of the building which gives access to the Parade as shown in photograph 3. 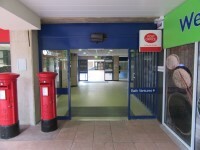 You are on Outside Access (Rear - South). Skip to the next section. 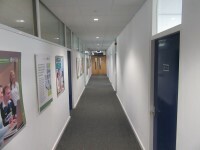 This information is for the entrance located to the rear of the South Side on the first floor. 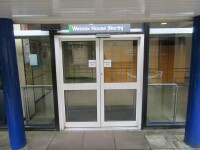 You are on Outside Access (North). Skip to the next section. 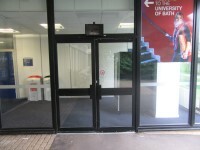 This information is for the entrance located in between Welcome Fresh shop and Santander. The door(s) open(s) automatically (towards you). 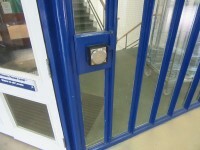 The door(s) is / are push pad activated. 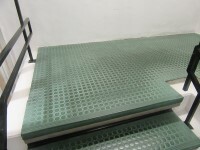 The height of the push pad on entry is 110cm. 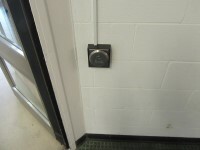 The height of the push pad on exit is 95cm. 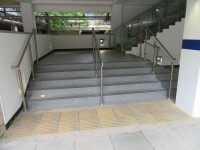 There is an identical entrance on the opposite side of the building which gives access to the Parade as shown in photograph 5. 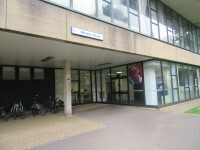 You are on Outside Access (Rear - North). Skip to the next section. This information is for the entrance located to the rear of the North Side. 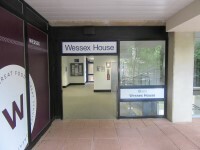 You are on Outside Access (West). Skip to the next section. This information is for the entrance located to the West Side of the building on the second floor. 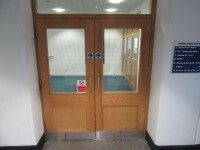 The width of the door opening is 148cm (4ft 10in). 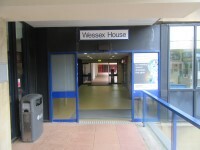 There is an identical entrance located on the first floor from the service road as shown in photograph 2. 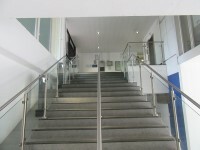 You are on Level Change (Access from Service Road (1st Floor) to South Side Entrance). Skip to the next section. 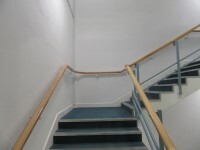 The step(s) is/are located on the South Side of the building. 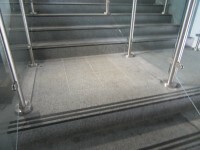 There is/are 15+ step(s) to the area/service. 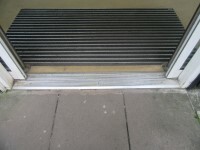 There is tactile paving at the bottom of the steps only. 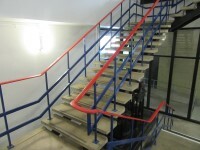 You are on Level Change (Access from Service Road (1st Floor) to West Side Entrance). Skip to the next section. 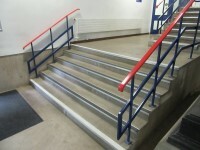 The step(s) is/are located beyond the West Side Entrance. 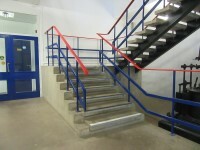 There is step free access throughout the building. 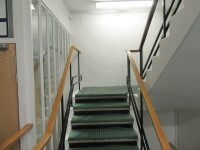 You are on Other Floors (South). Skip to the next section. 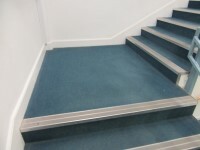 The floors which are accessible by stairs are 1, 2, 3, 4, 5, 6, 7, 8 and 9. 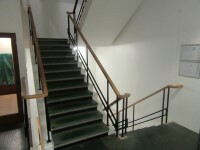 The stairs are located to the left from the South Side Entrance. 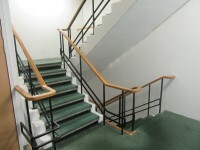 The stairs are approximately 2m from the South Side Entrance. 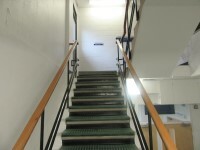 You are on Other Floors (North). Skip to the next section. 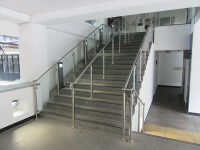 The stairs are located ahead from the North Side Entrance. 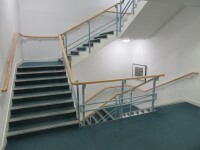 The stairs are approximately 3m from the North Side Entrance. 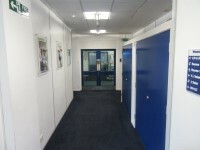 There are manual, heavy, double doors to access the stairwell on all floors. You are on Lift (South). Skip to the next section. 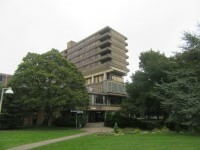 The lift is located just beyond the South Side Entrance. 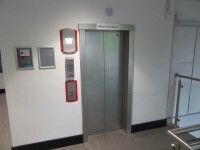 The floors which are accessible by this lift are 1, 2, 3, 4, 5, 6, 7, 8 and 9. 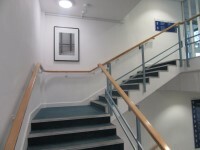 Wall mounted information boards are not provided at lift landings. 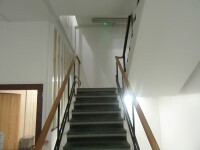 There are manual, heavy, single doors to access the lift lobby on the first floor, on the third floor, on the fourth floor, on the fifth floor, on the sixth floor, on the seventh floor and on the eighth floor. 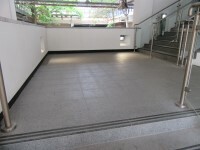 The lift is approximately 4m (4yd 1ft) from the South Side Entrance. 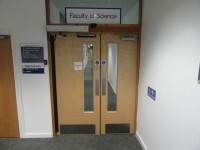 The clear door width is 79cm (2ft 7in). 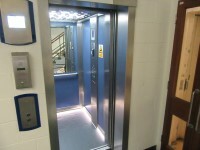 The dimensions of the lift are 100cm x 139cm (3ft 3in x 4ft 7in). 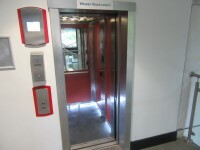 The lift does not have a hearing loop system. You are on Lift (North). Skip to the next section. 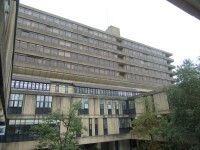 The lift is located to the left from the North Side entrance. 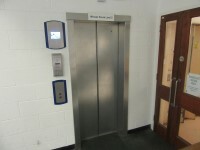 There are manual, heavy, single doors to access the lift lobby from the first floor upwards. 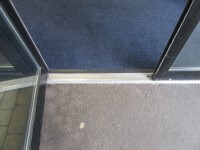 The lift is approximately 2m (2yd 7in) from the North Side Entrance. 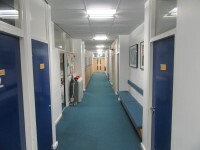 There is Braille, tactile, pictorial and written text signage on or near the toilet door. 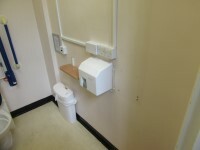 This accessible toilet is approximately 8m (8yd 2ft) from the South Side Entrance. 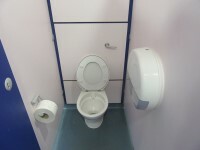 The width of the accessible toilet door is 94cm (3ft 1in). 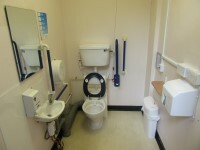 The dimensions of the accessible toilet are 144cm x 210cm (4ft 9in x 6ft 11in). 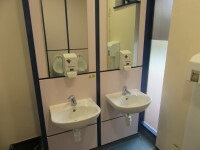 The height of the soap dispenser is 84cm. The toilet surveyed is located on the second floor of the South Side. 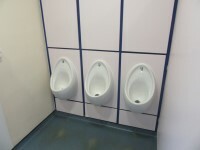 The standard toilet surveyed is approximately 10m from the South Side Entrance.